As I sit here and write this blog I have just had a sports massage. This has caused my brain to forget the pain of the The Wall as a very tiny size 6 lady manages to inflict more pain on me than any ultra-marathon ever could! The day before the event the little Mini was once again packed to the rafters with stuff that I probably wouldn't need but added "just incase". The dog was somewhere in the car, where I was not really sure. I had never been to Carlisle before, or Newcastle for that matter so it really did feel like an adventure. The journey up North took about 7 hours with many stops to stretch legs and find Tash (the dog) to let her have snoop around and a pee. Carlisle and the registration were easy to get to and we were welcomed by the beautiful sight of the Castle and the waterfall of poppies that are on tour currently. I met up with my running partner for the ultra, Kirsty who is a sessioned ultra runner and was taking it all in her stride. Registration was swept up with no queues and soon we had our race number and very exciting tracking device which would enable our friends family to watch us throughout the whole run (or so we thought). Kirsty had booked us a cosy cabin (WigWam camping) to sleep in for the night just a couple of miles outside Carlisle which was just perfect and only a couple of minutes walk from the local pub! We managed to abstain from any alcohol but ate way to much pie. I knew I had to go to bed early to get a good nights sleep before the early start and a very long run but sadly I seemed to only sleep very lightly. The alarm went off and I was happy to be out of bed and getting ready to start the run. Bring it on. Due to having a mini support crew we didn't have any bags to drop off. We had got to the start line with plenty of time for the final nervous wee and still reach the crucial starters brief before the off. We headed down to the bag drop area as that was where the toilets were and the queue for the loos were around the car park. I had to go...waiting diligently in the line I kept looking at my watch ticking as it was getting closer and closer to the briefing. The staff then started to shout we all need to be a briefing...ahhhhhh. I REALLY need to go...I managed to get to the front of the line and go for a wee trying my very best not to get annoyed that not enough toilets had been provided. Right I was sorted. Up to the briefing, sadly I could not hear any of the briefing as the organisers microphone did not work. Looking around the National heritage site of Carlisle castle, trying to take in the atmosphere of the event and think of the history of the wall and I was confronted with men peeing all along the castle walls. This is just not acceptable, it should not be allowed, in any another situation would you decide to pee up against a castle wall? Just because it is a running event doesn't mean it is allowed. I truly think those guys should have had their race numbers taken off them. There would have been a riot if a group of women pulled down the pants in the middle of everyone and pee'd. First rant over. Phew. 700people started the ultra-marathon just as it had begun to rain. It was forecast and we were all prepared. The first few miles of the route instantly took us out of the city into lovely park land. It was a great introduction. For these first few miles it is always hard to get into a rhythm and find where you should place yourself within 700 people. An ultra-marathon is all about pacing, I wanted to start off slow and hopefully stay about the same pace through out the 69miles. This balanced out before we hit the first Pit stop at 15miles. Another toilet themed crisis arose here, there were only 4 portaloos! The queue was about 15minutes long, that is a long time to stand around when you are not even one quarter of the way through an ultra marathon and it it is raining. Most people at about 15miles need to have their morning constitutions. This pitstop was the first point I saw our support crew, due to the nature of the route and the narrow roads the supporters are rightly advised only to meet up with the runners at four pitstops. The other 5 checkpoints should just be for the runners. Understandable. At that point I was sadly told that my snazzy tracker was not working and friends and family were worried that I didn't even manage to start the race. My tracker was replaced so fingers crossed it would work. It never did. The first half of the course was hilly, notably two big hills, the clincher was just before Walltown quarry, but this also meant we were coming into another checkpoint and some seriously spectacular scenery. Also for me it meant I could rejoice in having some off-road terrain. It was probably my fault when I signed up to The Wall that I didn't read the small print. The Wall is 80% on road, that means a whopping 56miles on road so the 13miles off road I relished and loved. They were also the most beautiful. We had seen Hadrians wall a good few times by now but the sightings were limited. In essential event information we were asked to carry also did not provide us with distances for the check points or pits stops, for some that may have been positive but for me I quite like to know how far I need to run before I can pick up my next bit of cake! However, it was lovely to see my husband and number one support dog at unexpected points to boost moral. The big rest stop was a known distance of 45miles, we knew here we could get some hot food and change clothes after getting soaking in a rather heavy downpour. Th rest stop didn't 100% go to plan, we got told off by the staff for cutting the queue for food (I was very confused why there was even a queue! ), I had been dreaming of soup as that was what was mentioned in the info pack but was then informed that there were meatballs or chilli to eat. Both in my eyes are not that suitable for running a really long way. However I tried to smile at the now very grumpy staff member as I had pushed in front of the line and I being bamboozled by the food choices. Anyway, I went for broke and wolfed my chilli down hoping in would stay put. Unfortunately for my team mate the chilli didn't stay put at all, with 24miles to go Kirsty started to struggle with tummy problems and a knee injury that reared its head. We had made really good time and it was sad to see that go to waste but after a lot of talking about the best options for our team we decided to stick it out together. Our running turned into an extreme power walking for about 18 miles of the 24 miles left but we were still racing along a over 4 miles per hour. Kirsty's determination to finish was amazing but walking took its toll out of both of us. The last check point at Newburn Tyne Riverside was at 61miles. Only 8miles to go. it seems nothing but also such a long way during an ultra. we were determined to finish this in the best time we possibly could, we aimed for two hours to the finish. An emotional goodbye to the support crew as we knew the next time we would see Will and Tash would be at the finish. The last 8 miles felt like an eternity. I was starting to get a blister on the ball of my right foot due to walking; I was trying my best to ignore it, I knew in the place it was there was little I could do about it until the end. 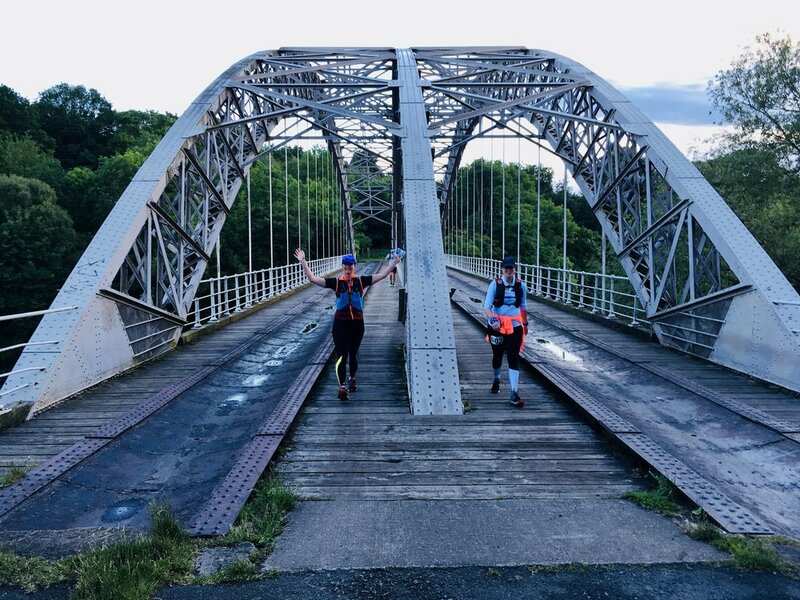 The last 8 miles was all flat along the tyne and into Newcastle itself, the sun had gone down and slowly but surely we started to see lights from houses and then lights from the 7 bridges on the Tyne, the last bridge of which indicated our finish. From first spotting the Millennium bridge it was still a distance of about 2 miles before we plucked up the energy to run over it and then through the finish line. The feeling of finishing an ultra-marathon is indescribable and the feeling of finishing an ultra in the circumstances that we did and as a team was incredible. Our time was a good couple of hours slower than we wanted but in the end who cares; we succeeded. We were extremely shattered but so proud of ourselves. We had completed The Wall in 16hours and 47minutes. That time I will never get back but will treasure forever. As previously mentioned I wasn't impressed by the Rat race organisation but the Ultra itself was a delight. With a £200 entry fee I would have liked to have seen more toilets, friendlier staff, mile makers and motivation signs, better information in the essential event information that we had to carry and trackers that had a chance of working would be nice, more medical provision or self help areas and maybe a non-spicy option at the lunch stop (the grumpy lady may have only given me this choice on purpose of course). I am able to eat chilli con carne and run! Bonus. Like, comment or share this blog. The more people it reaches, the better, and that will bring more awareness of the thirty4thirty challenge I am doing. Donate to Young Minds via the just giving link below or through the website using the donate button.